The United Arab Emirates (UAE) has a desert climate, characterized by pleasantly mild winters and very hot and sunny summers, when the humidity of the Persian Gulf makes the heat unbearable. The annual precipitation is almost everywhere below 100 millimeters (4 inches) and is concentrated in the winter months. The rains are rare, but they occur in the form of showers or downpours, which sometimes can be intense. The country is made up of seven emirates, almost all overlooking the Persian Gulf (Abu Dhabi, Ajman, Dubai, Ras al-Khaimah, Sharjah and Umm al-Quwain) and one overlooking the Gulf of Oman (Fujairah). 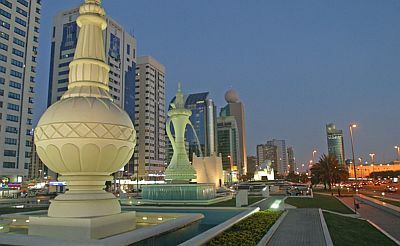 The biggest emirate, which also includes the capital, is Abu Dhabi, even though the most famous one is Dubai because of its futuristic buildings and modern tourist resorts. In Dubai, the daily average temperature ranges from 19.5 degrees Celsius (67.5 °F) in January (so we are at the boundary between the subtropical and the tropical climate) to around 36.5 °C (98 °F) in August. Here are the average temperatures of Dubai. In a typical year, only 98 millimeters (3.9 inches) of rain fall, most of which occur between December and March. In Abu Dhabi, still on the coast but more to the west, it rains even less, around 50 mm (2 in) per year. Here is the average precipitation in Dubai. The sea in the Emirates is warm enough for swimming all year round, although from January to March it drops to 23 °C (73 °F); in summer, it gets very warm, and it exceeds 30 °C (86 °F) from June to October, so as to allow long swims. On the Gulf of Oman, in winter the sea is a bit warmer than in the Persian Gulf. Here is the sea temperature in Dubai. Summer is very hot and sunny, with daytime temperatures ranging from 39 °C to 42 °C (101 to 107 °F) between June and September, and with the wind from the Persian Gulf that brings moist air from the sea, making the heat sweltering. April and October are also hot months, with highs around 34/36 °C (93/97 °F). During the hottest days the temperature can reach 47/48 °C (117/118 °F) on the coast, and even more in the interior. In the northeast, the Al Hajar Mountains, which separate the coast of the Persian Gulf from that of the Gulf of Oman, the climate is still desert, although in the winter months it rains a bit more often than in the plain. Temperatures do not drop by much compared with the plain, except in the areas above 1,000 meters (3,300 feet), where it can get cold in winter, while in summer the heat is more bearable. 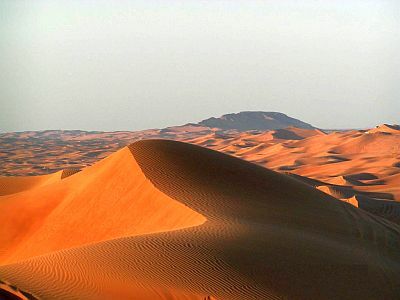 The south of the country, in the emirate of Abu Dhabi, is occupied by the vast sandy desert of the Rub al-Khali and is almost uninhabited except in the oases, such as that of Liwa, and near oil and gas extraction facilities. Here the climate is similar to that of the coast, and even hotter in summer, but the air is drier because of the greater distance from the sea. The sun in the Emirates shines all year round, sometimes however some cloud banks may pass over the country, both in winter and in summer. All year round, but especially in spring, the United Arab Emirates may be affected by strong winds, which can bring dust and sand storms. Every now and then, the United Arab Emirates can be reached by tropical cyclones, which bring strong winds and heavy rains, though more rarely than in neighboring Oman, as happened with Cyclone Gonu in early June 2007. The area most at risk is the northern one, and in particular the emirate of Fujairah, which is exposed on the coast of the Gulf of Oman; in contrast, the inland and western areas are generally spared. Cyclones form from May to December, and are more frequent at the beginning of the period (May-June) and a little less at the end (October-December). The best time to visit the United Arab Emirates is winter, from December to February, which is a pleasant and sunny season. Thus, you will avoid the oppressive heat of the long summer months. For a beach holiday, the best months are March and November (with a preference for the latter because the sea is warmer), while in the long summer, when it gets too hot, even sunbathing can be a challenge. In winter, pack light clothes for the day, a sweater and a jacket for the evening and for cool days, a scarf for the wind. In summer, pack lightweight clothes, loose-fitting and made of natural fabric (cotton or linen), a desert turban, a sweatshirt and a scarf for air-conditioned places. When going to the reef, you can bring snorkeling equipment, including water shoes or rubber-soled shoes. It's better for women to avoid shorts and miniskirts outside tourist resorts.